For the past few weeks, the first thing I’ve done every morning when I get into the office is pull up the Lapper website to see how much money we’ve raised for much-needed programs for people with cancer in our community. Today, our total surpassed $45,000. That will go a long way in supporting families dealing with the health crisis that is cancer. Those who know me best, know how much this organization means to me. My job here is much more than a job- it feeds my soul because I know that every ounce of energy I put in directly and positively impacts someone in our community who needs help. Our entire team feels that way and we have the great honor of sharing a small part of the cancer journey with our clients; their strength, in the face of fear and great challenges, inspires us. That is why we do what we do. We’d like to thank a group of volunteers from Vera Bradley for helping us paint our gigantic cancer ribbon, which will be used at our upcoming Lapper for team pictures. 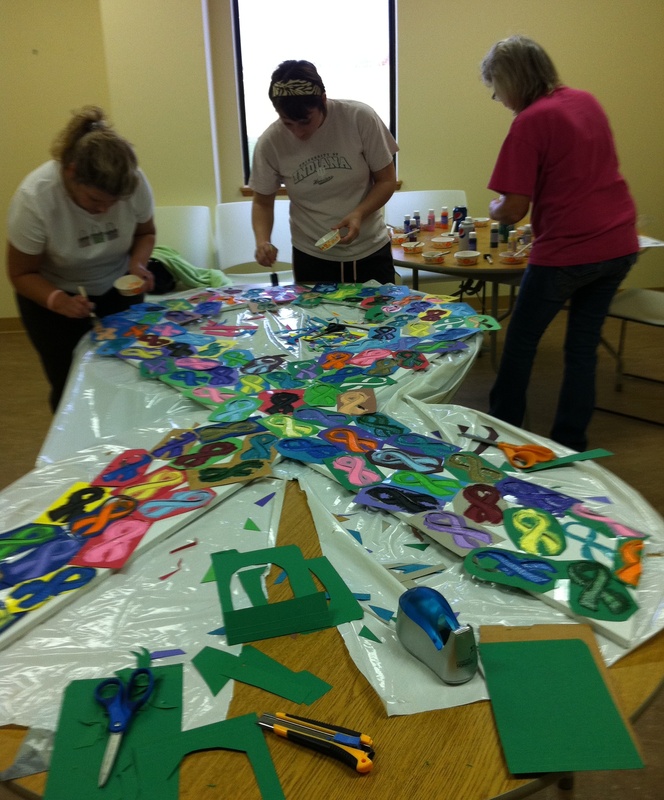 The Lapper & Survivors Day committees wanted something that represents all types of cancer. 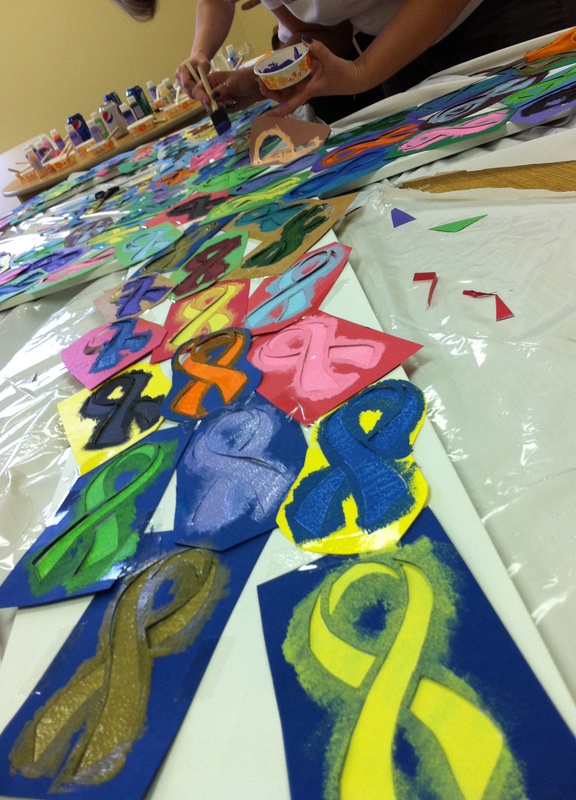 Volunteers worked hard last night to stencil a rainbow of cancer ribbons onto the 7-foot-tall wooden ribbon. For information about how you can volunteer, visit cancer-services.org or call our volunteer coordinator Cheryl Dafforn at (260) 484-9560. 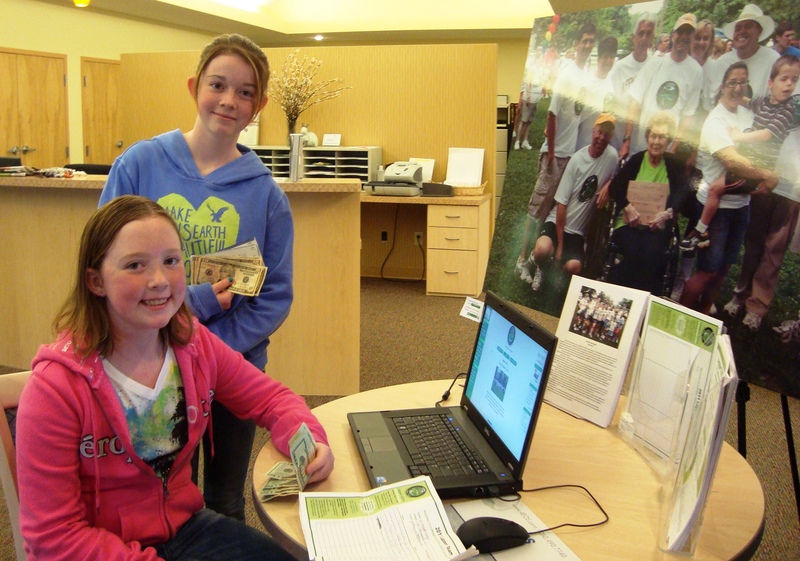 One of the many fun aspects of Lapper, our annual fundraising walk, is that it’s an event the entire family can enjoy. We hope you will consider joining us this year. More information can be found on our website: www.lapper2011.kintera.org. And don’t forget, our annual Survivors Day Celebration will take place immediately following this year’s Lapper. Guests will enjoy food, fun and entertainment in the park. Thanks to Lauren and Jill Knappenberger for visiting us last week and bringing in over $245 in donations, which they’ve raised for their team. When Kent passed away in October of 2008, he was only 62. He left behind his wife, Denise, and three daughters: Erin, Anna and Ashley. He had four sisters, one brother and countless in-laws and friends. Most participate in Cancer Services’ Lapper each year. Many come together physically to walk, others walk with them by contributing financially. They even have family members contribute to the Lapper and walk in North Carolina the same morning they walk in Fort Wayne. Kent was able to remain at home largely because of the emotional and financial support given to the family from Cancer Services. The Lapper is one way for all who loved Kent to honor him and to pay it forward to Cancer Services so they can help other families in need. Team Kent participates in the Lapper because it is an annual day that is all about Kent. It gives them the opportunity to come together in support of a good cause and in remembrance and honor of a great man. It is important to them that his life and the loss in his death are never forgotten by those he loved. That Saturday once a year, helps to ensure that it doesn’t. 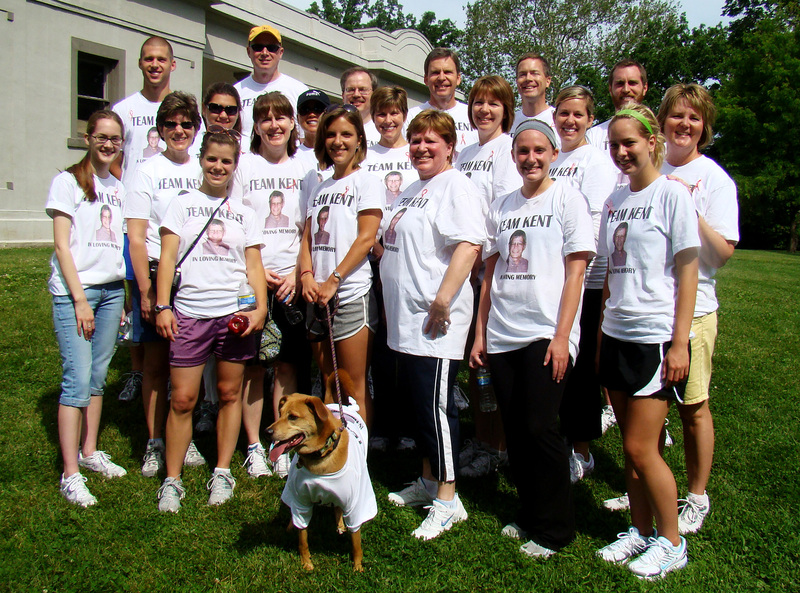 We will host our annual fundraising walk, Lapper, on Saturday, May 21, 2011, at Foster Park, located in southwest Fort Wayne. 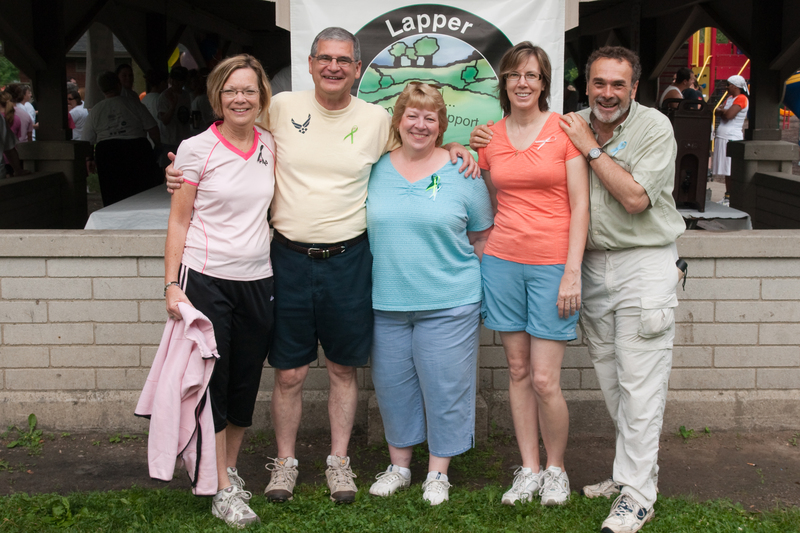 Lapper 2011 is a fundraiser for Cancer Services designed to honor or memorialize those touched by cancer. When Lapper founder Jill Burnett first organized this event 9 years ago, she encouraged people to test their own endurance and push past their comfort zone just as people with cancer do every day. That tradition continues today, and each Lapper participant is encouraged to walk as many laps around the paved 2-mile trail at Foster Park as they can. Bring a friend, form a team and help us raise money to provide support and services to people with cancer in our community. Our goal is to raise $60,000 at this year’s event. All proceeds benefit Cancer Services of Northeast Indiana and help support programs for people with cancer in our community. Online registration will be available soon. Walkers who register by May 1 and raise a minimum of $25 will receive a tee shirt. Water and fresh fruit will be provided and the walk will take place, rain or shine. Cancer Services will host Survivors Day immediately following the Lapper at Foster Park on Saturday, May 21, at 11:00 a.m. This free celebration of life and survivorship will include food, fun, and games for the entire family.